Typically, using the words “cornmeal” and “pizza” in the same sentence is a surefire way to send my attention scurrying elsewhere. 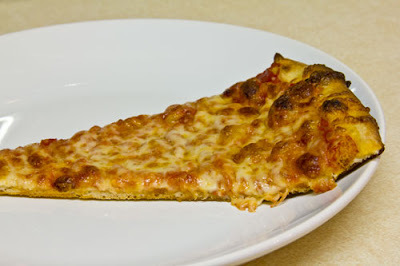 It isn’t that I dislike deep-dish pizza, it’s just that I’ve never had one that I thought was anywhere near comparable in quality to pizza made with a dough of traditional wheat flour and yeast. 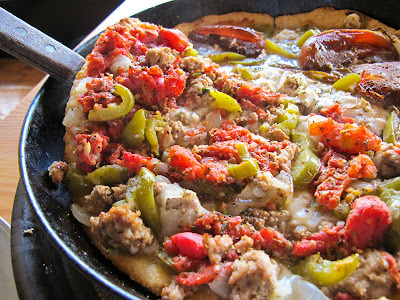 Part of the problem comes with comparing the two in the first place, the crowbar separation between conventional pizza and deep-dish pies--particularly those of the Chicago persuasion--and the generalization of lumping it all together. 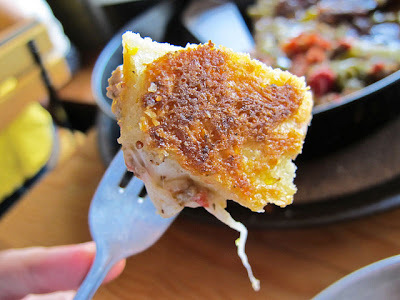 And while Dove Vivi doesn’t revolutionize cornmeal crust pizza, it takes it in a direction that, for the most part, I find preferable to most deep-dish gut bombs and their ilk. 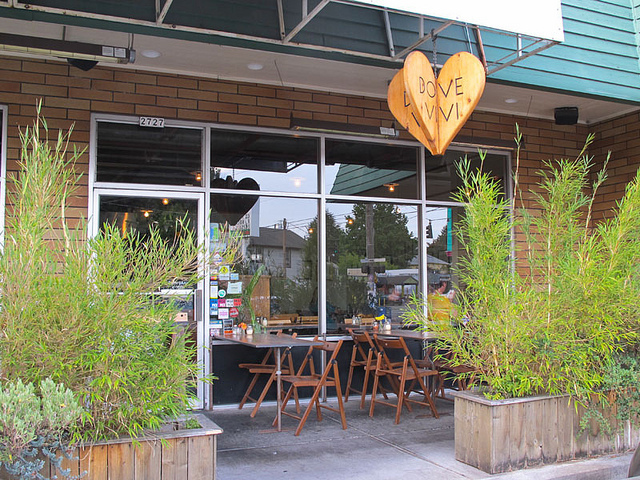 Perhaps the most important distinction between a regular cornmeal crust pizza and the crust served at Dove Vivi is that Dove Vivi’s crust is not, in fact, strictly cornmeal. Rather, it’s a blend of cornmeal and Shepherd’s Grain wheat flour, well-salted and buttery in flavor. Those beauties then get baked for up to 15 additional minutes when the toppings are piled in. The result has the soft, chewy interior of homemade shortbread and the crunchy exterior of cornbread cooked in a cast-iron skillet. It doesn’t crumble like cornbread, though, maintaining its structure and withstanding the not-insubstantial payload of toppings admirably. So now that we’ve established that this is a crust worthy of your time, what about what goes in the crust? Is that any good? Well, it really depends on the pizza. What sounded great on paper but didn’t come off nearly as well as I’d hoped was the Sausage & Peppers pizza (all pizzas are 12” and are priced at $4.25/slice, $11.50/half, $22.50/whole). 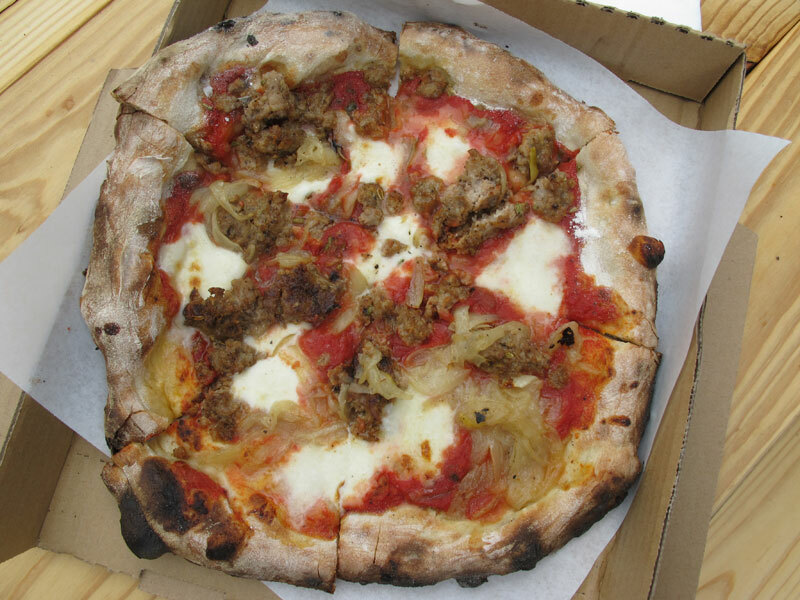 For this pie, Dove Vivi fills that wonderful crust with aged mozzarella, house-made fennel sausage, caramelized onions, marinated green peppers, and tomato sauce. I wasn’t kidding when I said it sounded great, was I? Unfortunately, the pie, as prepared on this visit, wanted for flavor. The large, bright red hunks of tomato that comprised the “sauce” were heavily herbed and had a stewed quality to them, but I was surprised to find that they really didn’t taste like much. It felt as though everything about the flavors in the tomatoes--the acidity, the brightness, even the herbs--had been toned down. Same goes for the sausage, which despite the ample presence of fennel seeds could barely shout over the competing toppings. The onions, when plucked and eaten separately from the slice, had a nice softness and mild sweetness to them, but caramelized they were not; more like heavily sweated (see the fennel sausage & onions pizza at Ken's for properly caramelized onions). I liked that the green peppers were marinated to lessen both the crunch and the sometimes-too-bitter-for-me overtones of raw green peppers, but yet again, there just wasn't much flavor there. 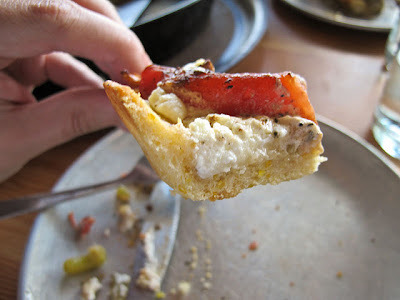 The same could not be said for the Goat Cheese pizza, which got just about everything right. Goat cheese and mozzarella comprised the bulk of the toppings, and while that sounds like the very definition of rich & heavy, it wasn’t overwhelmingly so. Sure, there’s quite a lot of goat cheese on each of these slices, but it pairs very well with the crust and its richness is cut by the acids in the huge slab of marinated tomato resting over the slice. 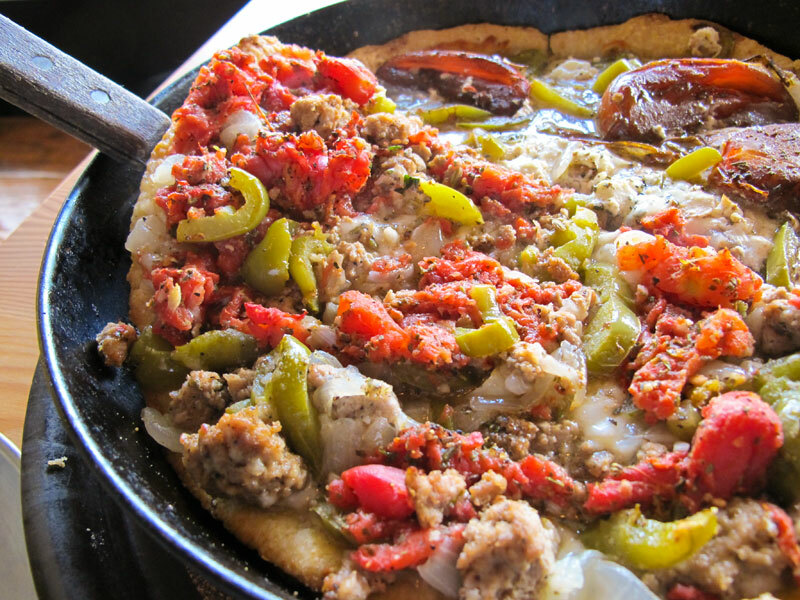 That tomato triumphed where the tomato “sauce” on the Sausage & Peppers pizza failed: it was juicy, bright, and a little sweet. A better foil for thick, creamy goat cheese you couldn’t ask for. 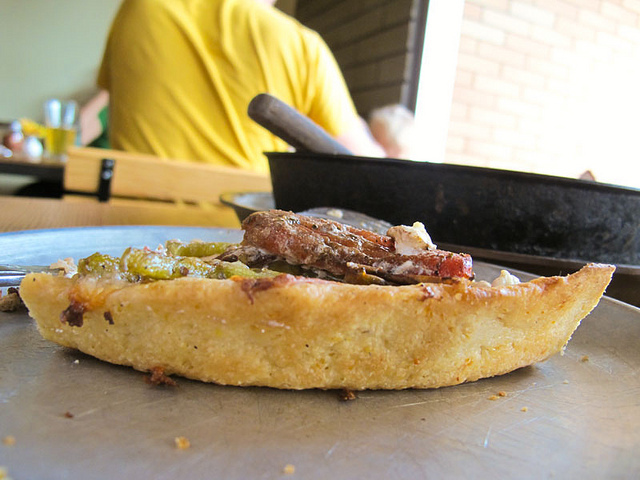 The marinated green peppers made a second appearance here, bringing only the same muted flavors they brought to the Sausage & Peppers pizza, but the addition of rosemary was a subtle touch that added some complexity to this pizza’s flavor profile. This is hearty, hearty pizza, about half the thickness of Chicago-style pizza but just as filling (two slices will do most people in). I appreciate the way Dove Vivi embraces unusual toppings, because let’s be honest, this is unusual pizza that probably won’t scratch your “pizza itch,” although it is certainly satisfying. I for one am looking forward to returning for the pie with fresh sweet corn and smoked mozzarella. Growing up in a small town in the southwest corner of Washington State on a 28-mile finger of land known as the Long Beach Peninsula meant one thing as a pizza-lover: pure misery. Many tried to bring pizza to our tiny string of hamlets over the years, but no one did it successfully, and only one spot (Chico’s, which maybe I’ll review someday if I’m bored) has really survived the harsh economic reality of business on the Long Beach Peninsula: three months of feast thanks to summertime tourists galore and nine months of famine in a cold rain-and-sea-spray-soaked vellum. 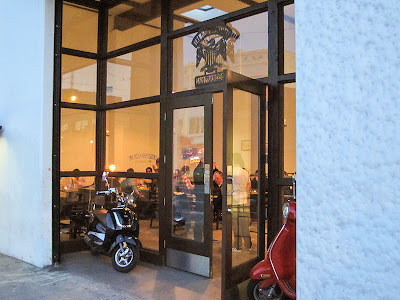 In fact, with the exception of the inimitably good maple bars at the Cottage Bakery in downtown Long Beach, I have zero recollection of any great food ever being served to me in a restaurant on the peninsula during my youth, let alone great pizza. The sad fact is that a drive across the river into Astoria, Oregon, was a real treat, because it meant a visit to Pizza Hut. Pizza Hut! That’s how dire the culinary scene was (and, to a large degree, remains) in Long Beach. So imagine my surprise when I heard that someone had opened a tiny food stand in my old hometown. And not just a food stand, but one serving pizza. 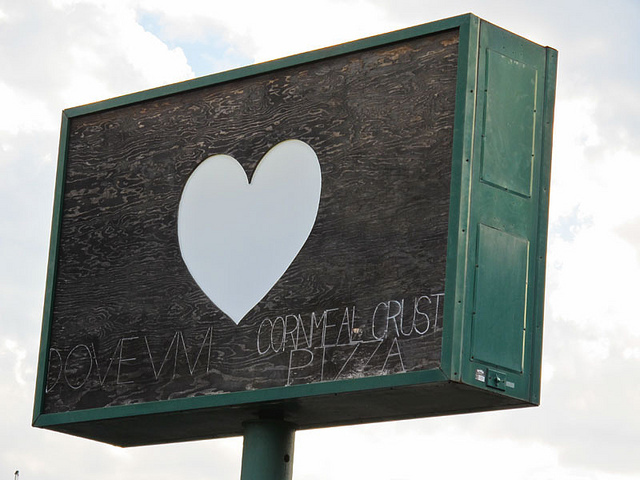 And not just any pizza, but wood-fired pizza. My mind could barely compute this information; black was white, up was down, left was right. I knew I had to try Serious Pizza Plus as soon as possible. 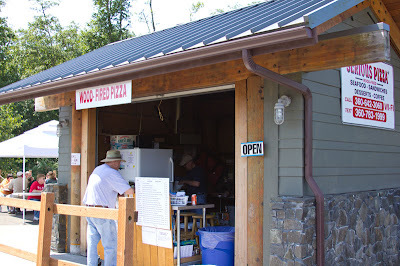 My first attempt did not go successfully; Serious Pizza Plus is not open in the winter months, which makes sense, given that it’s smack dab in the middle of beautiful Cape Disappointment State Park’s campground. Its business relies mainly on walk-up orders from the surrounding campers, and few visitors prefer to spend their Decembers shuddering in a tent a stone’s throw from the frothing maw of the Pacific Ocean. A recent July afternoon visit, however, proved fruitful, with owner Jim Chrietzberg and his wife Chi taking orders and making pies as fast as they could for the impressive crowd out front. While I stood around snapping photos, I can’t tell you how many people came up to Jim after finishing their meal to tell him how wonderful the food was and how they were going to return that evening for dinner. 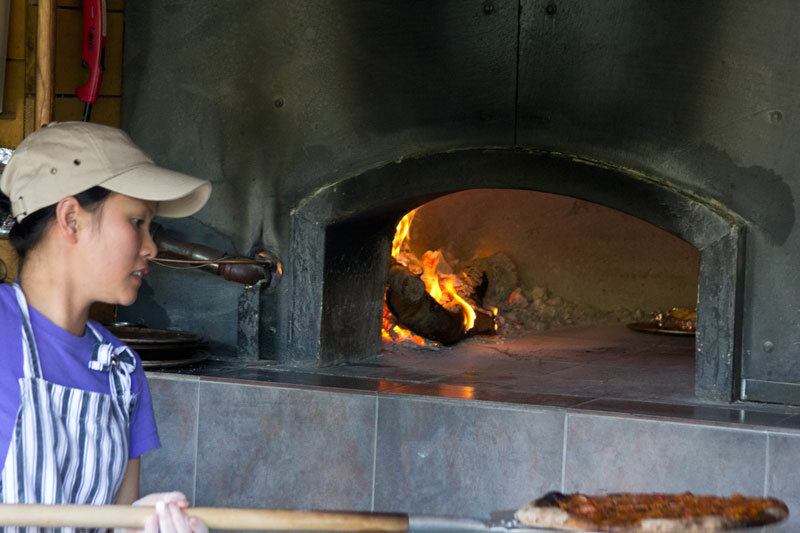 The Chrietzbergs have done a fantastic job of culling the affection of park regulars (this is their third year at the site) with their relaxed and friendly demeanor, the obvious pleasure they take in what they do, and their actual pizza, of course. Oh yes, the pizza, that’s what you’re here to read about, isn’t it? Well rest assured, this pizza stand in an out-of-the-way state park is no mere gimmick: Jim and Chi are putting out the real deal. 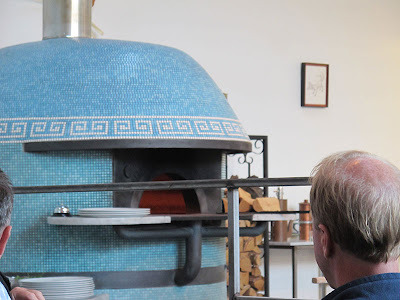 This is good-quality wood-fired pizza made from a properly salted, fermented dough that gets a lightly charred and crisp exterior that crackles audibly as it gives way to its soft crumb. The tomato sauce has a bright quality to it and a hint of garlic, and the fresh mozzarella is appropriately milky and properly melted (a point I note after my experience at Una Pizza Napoletana). With the final addition of basil chiffonade this becomes one solid Margherita ($20), not just good for a state park, but good for anywhere. 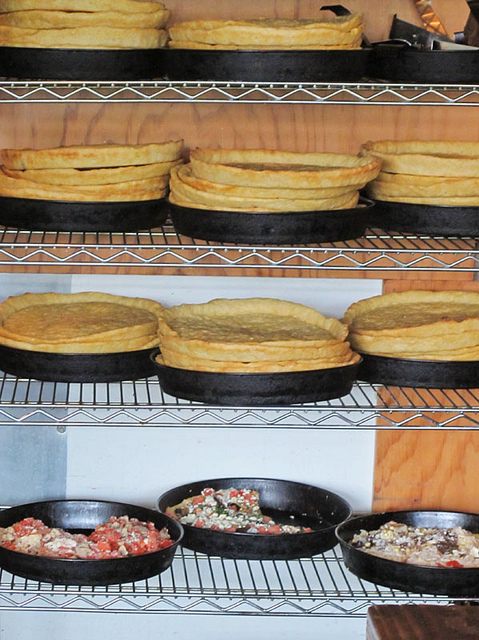 Pies come in two sizes: single-serving 8-inch and feed-the-family 15-inch. Most of the larger pizzas run $20-$25, and yes, they can do half-and-half. Unless you have a favorite, half-and-half is the way to go if you want to have any hope of getting through the substantial menu before the season ends. Also, the 8-inch pies, quite frankly, are only going to leave you hungry and send you back in line for a second pizza. Beyond the Margherita, I also sampled the Earth Pie, the Pepperoni, and the Meat Lover. The Earth Pie ($23) would never have been my first choice at any pizzeria, simply because of the addition of raw sliced tomatoes, but Jim gave it his strongest recommendation, so I bit. 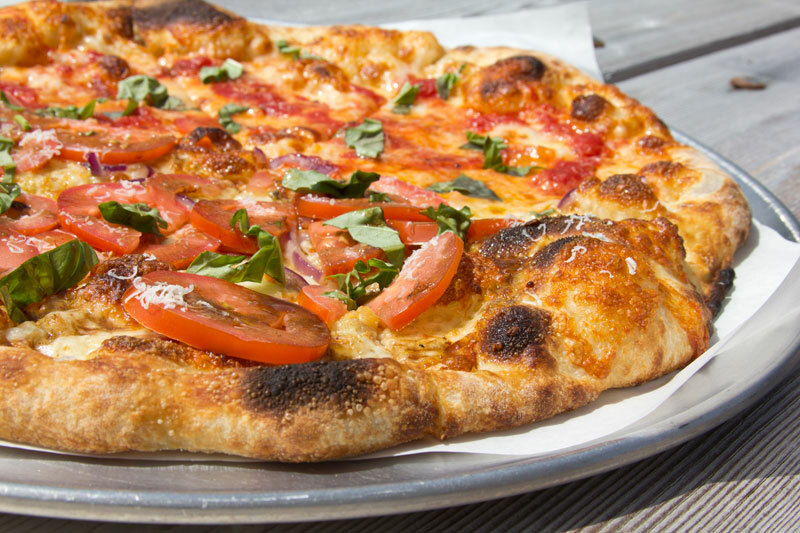 The thickly sliced tomatoes adorn a base of garlic, olive oil, balsamic vinegar, gorgonzola, red onions, and basil. With Jim’s suggestion to sprinkle a little sea salt over the tomatoes, the pie became more than palatable; it was actually quite delicious. Texturally I still find it somewhat awkward to eat sliced tomatoes on a pizza, but the palate of flavors presented with them on this pie makes it worthwhile. It’s been a while since I've had as good an interpretation of the classic Pepperoni Pizza ($21) as the one I had at Serious Pizza Plus. The key here is good pepperoni that actually has some heat to it, without being overwhelmingly spicy. I also prefer my pepperoni sliced paper thin; that way it crisps up in the oven and doesn’t transform into goblets of grease (I also like that kind of pepperoni, by the way, just not as much). There’s a lot of flavor packed into those salty, oily discs, which is why this was far and away my favorite pie of the day. 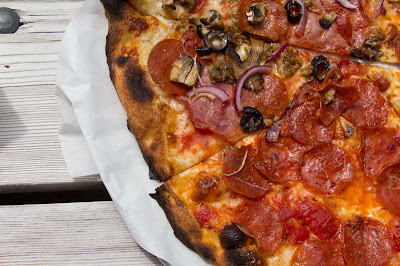 The pepperoni makes another appearance on the Meat Lover ($25), though it’s half-hidden beneath a smattering of sausage, Canadian bacon, red onions, olives, and fresh mushrooms. 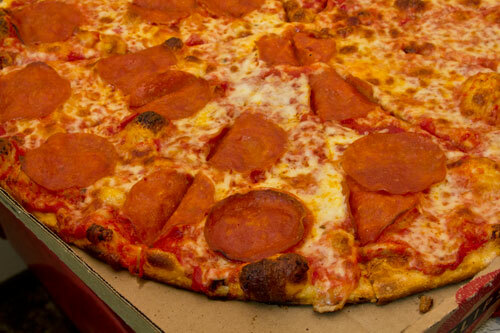 I don’t mind “supreme” pizzas but they’re never my favorite, and while I think the simplicity of the Pepperoni pizza surpasses this pie, it’s still well executed and very much worth your time and money, if this is the style you crave. A perusal of the User Reviews on Yelp (a site comparable to a rupturing wart but the only source of online information I could find for this place) reveals that “the best pizza I’ve ever had” is not an uncommon reaction to Serious Pizza Plus, especially for Southwest Washingtonians. It’s obvious why. Long Beach set the bar ludicrously low long ago, but the Chrietzbergs weren’t content with maintaining the status quo, and they have singlehandedly surpassed decades of competition without batting an eye. NOTE: A Discover Pass is required for parking in Cape Disappointment State Park, but if you’re only there to order/pick-up pizza, don’t bother stopping at the ranger’s station; just drive right through, park in the short-term parking, grab your pie, and split. 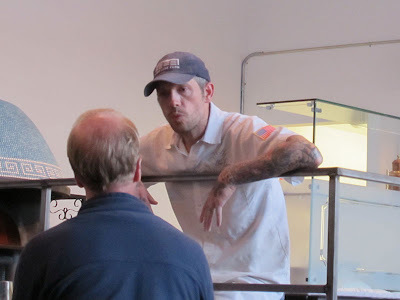 I briefly met Anthony Mangieri in 2009, right after he sold the New York location of the much-lauded Una Pizza Napoletana (UPN) to Mathieu Palombino (he of Motorino fame). Mangieri was manning the oven for a Serious Eats event while Palombino made the actual pies, so despite being in the same room with him, I still hadn’t had his pizza, not really. Fast-forward to a 2012 trip to San Francisco (my honeymoon, actually). 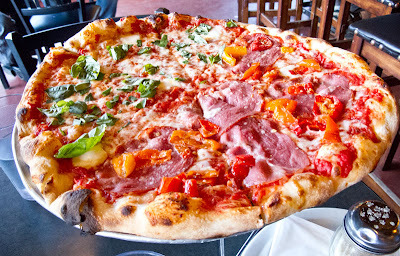 Mangieri had by then moved UPN to the West Coast and continued to reign as undisputed king of the United States’ Neapolitan pizza scene. 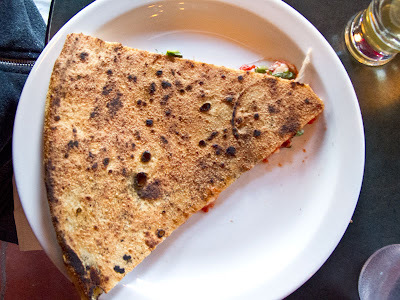 On this particular visit, I wanted to eat at Una Pizza Napoletana more than any other restaurant, and it finally happened. Yes, it was good. Great, even. But I couldn’t help but leave disappointed. And I’ll tell you why. 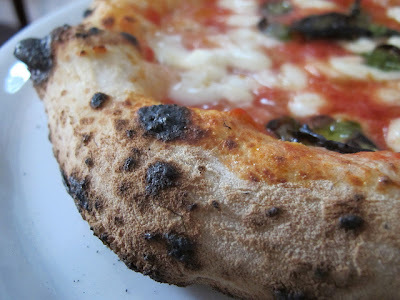 In the years between 2009 and 2012, I have eaten a lot of authentic Neapolitan pizza. And I mean a lot of it. 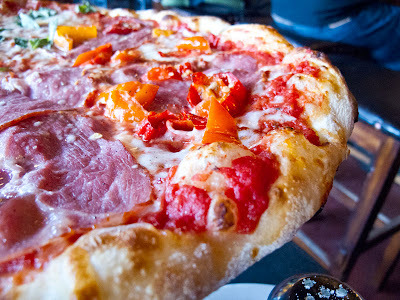 There are certainly degrees of quality from one location to the next, but generally most places attempting to do authentic Neapolitan pizza hit pretty close to the mark. 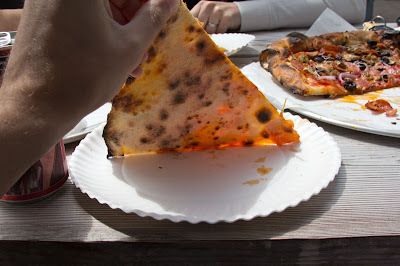 But even the very best places I tried (Keste in New York City comes to mind) couldn’t definitively best my favorite non-Neapolitan pizzas across the country (Pizzeria Bianco in Phoenix, Ken's or Apizza Scholls here in Portland, or Di Fara in New York, for example). Given that UPN receives so much praise from pizza aficionados year after year while Keste receives far less, I assumed that Mangieri must put out a product that's clearly of a much higher caliber. Based on this visit, I would have to say he doesn't. At least not in 2012 with all of today's competition. Before you spew your cola all over your keyboard, let me first assure you that the pizza at UPN is of the highest caliber. 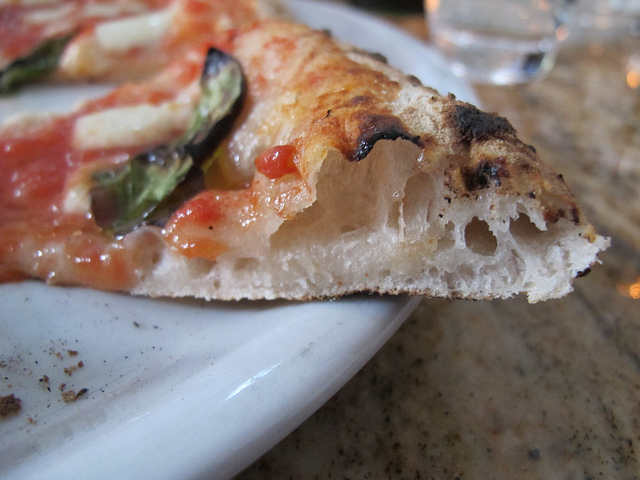 By that I mean that it was as good as any Neapolitan pizza I’ve ever eaten--but no better. 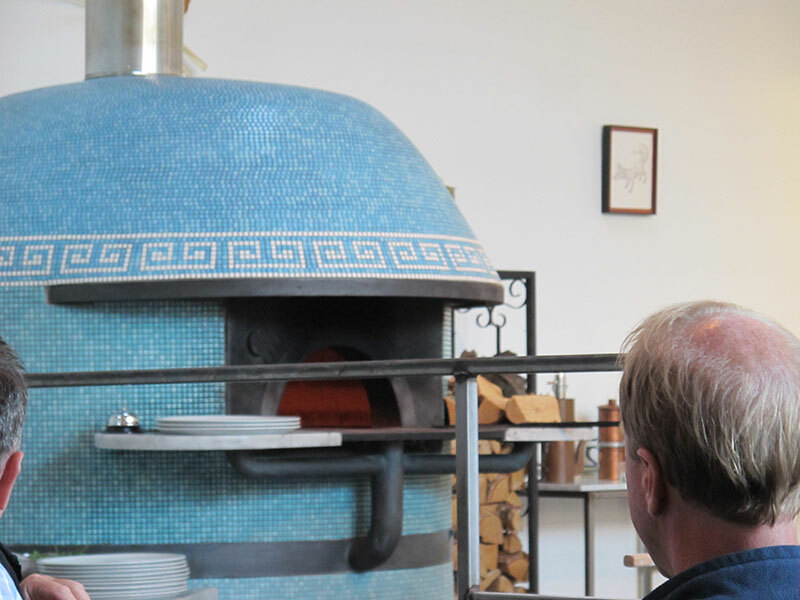 Everything about the pizza was excellent, but then so is the pizza at Keste. 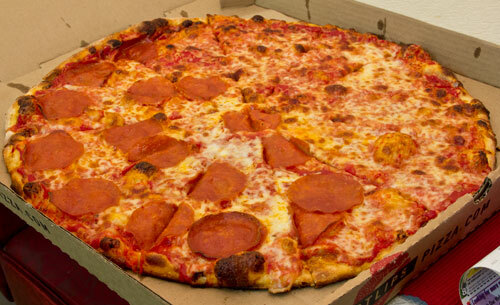 With all that said, let’s talk about the actual pizza. Make no mistake, it is very, very good. At $20 a pop, I couldn’t really afford to try more than two, but two pizzas are plenty for two people, especially because most of the pizzas on the menu are only slight variations of the others. 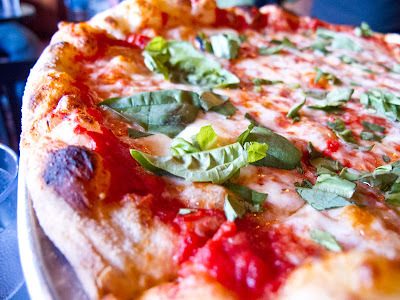 I started with the Margherita, and a gorgeous Margherita it was. 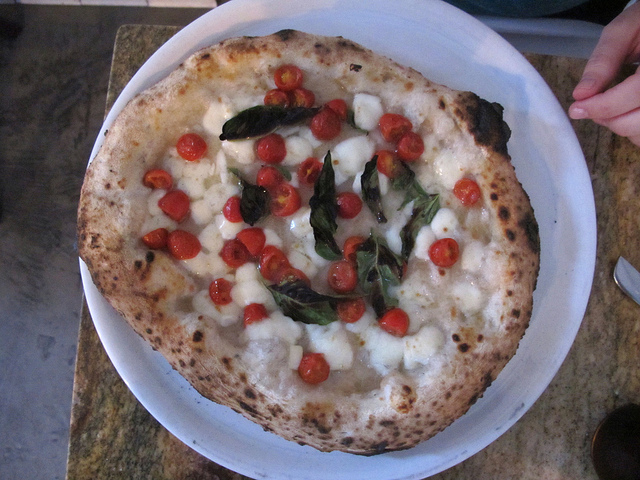 Beautiful blistered cornicione, vibrant and fresh-tasting tomato sauce, and milky buffalo mozzarella. I do wish there was more basil, but what was there accomplished its given task. It arrives uncut, one of my pizza pet peeves, but given that Mangieri is aiming for the authentic target here, it’s hard to complain too much. I will say this about Mangieri’s dough: it is more flavorful than the dough served at 90% of competing Neapolitan pizzerias. There’s a distinct flavor of fermented yeast in the crust, and coupled with the carbonized mottling it really is a pleasure for the palate. The intense heat from the wood-burning oven promises a thin, crisp exterior to the dough and a soft, airy inner crumb with ample elasticity. I’ve eaten better-tasting Neapolitan crusts before, but not many. Besides the meager application of basil, my only modest complaint with the pizza was that the buffalo mozzarella had not quite fully melted. Typically, melting isn’t a problem with buffalo mozzarella; it’s much creamier than cow’s milk mozzarella, and in my experience often ends up a little soupy on the finished pie. But here it was just shy of rubbery, in that buffalo mozzarella purgatorial zone between cold lump and cheese pool. Probably an unavoidable misstep given that any longer in the oven may have burned the crust, so perhaps the oven wasn’t cooperating fully that day. Much has been said of the fruity olive oil Mangieri uses to finish off his pizzas, but I honestly couldn’t pick it out among the other flavors on the Margherita. If this is a major contributing factor to the $20 price tag on these pizzas, then I would humbly make the suggestion to find something just as good but less expensive. Because--tangent alert--I think $20 is too much to pay for this pizza. Sorry, but it’s how I feel. Even considering San Francisco rent prices, this feels high to me. Pizzeria Delfina sells an excellent Margherita about a mile away for only $13. Delfina may not be using the imported ingredients Mangieri uses, but if the end product is nearly as good (or just as good, depending on who you talk to), those seven extra dollars are hard to fork over. You could make the same argument for Di Fara in New York, which charges $5 for a slice of pizza, except in that case I really do feel like the pizza is superior to just about everyone else’s. At UPN, the pizza’s not head and shoulders above everyone else’s, so the premium isn’t worthwhile to me. 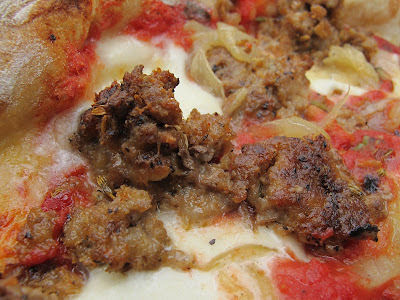 The flavors on the Filetti were a bit more muted than I would have liked (in pretty stark contrast to the Filetti I had at Motorino in 2009), but it was still a well-executed, delicious pie. No tomato sauce here, just buffalo mozzarella (again, not quite melted, as you can see most clearly in the chunks near the top of the photo above), olive oil, sea salt, basil, garlic, and cherry tomatoes. The key to using fresh tomatoes on a pizza is to cook them, either on the pizza in the oven or beforehand and added to the pizza post-oven. These were fantastic. They burst with sweet juices. 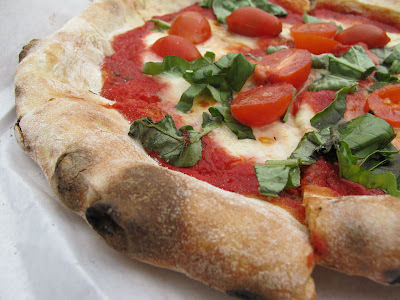 The garlic also came through quite strong, and those are really the dominant flavors on this pizza: tomatoes and garlic. Again, I felt it came across a little muted, but far from bland. 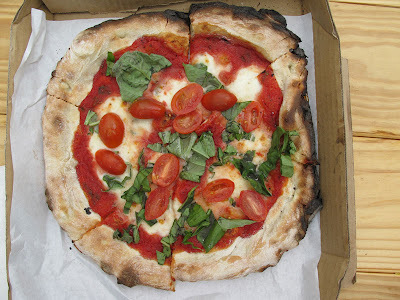 I liked the Margherita better, but this is an interesting take on a white pie nonetheless. I’m aware these opinions differ somewhat from the established collective response to Una Pizza Napoletana. I think it’s important to note that these are only one person’s thoughts, and they’re based on one visit to UPN (which is why this write-up is just an “Impressions” rather than an authoritative “Review”). Anthony Mangieri’s Neapolitan pizza is as good as I’ve had, and if Neapolitan pizza is all you’re seeking, you won’t be unhappy (although the price might make you think twice about fully exploring the menu). UPN is proof that you can only take rigidly defined authenticity so far, and as good as it is, I think this country has taken pizza to farther and better places. 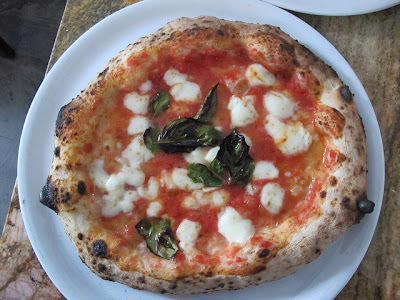 Anthony Mangieri can’t be faulted for making Neapolitan pizza, though, and I wouldn't want the Neapolitan style to go away, because sometimes it's what I crave. Mangieri making something he loves, and he’s not advertising it as anything other than real Neapolitan pizza, so how can anyone (like me, for example) expect otherwise? 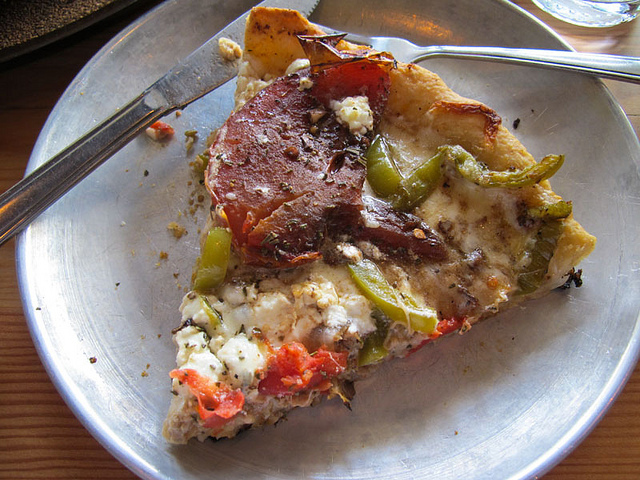 Anyone who enjoys good pizza has to appreciate living in Portland today. 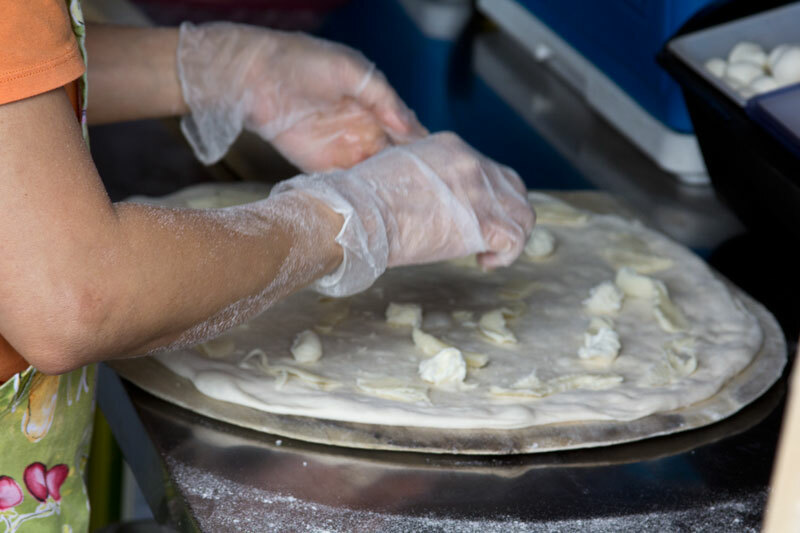 Not only has the city’s overall pizza scene climbed steadily in quality within the last five years or so, but so have the food carts stepped up their game when it comes to putting out quality pies. Carts like Wy’east, La Pizza Pela, and Pyro are all making solid pizza without the need of a brick-and-mortar location. 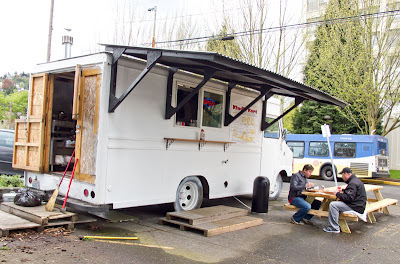 Now there’s a cart making better pizza than almost any of them, and it’s Kindle Kart up on NW 27th, across from the iconic Montgomery Park building. Looking at the menu (online here), I was struck first by how inexpensive everything is: There isn’t a pizza over $8. Sharp contrast to most pizzerias around the country, which seem to be pushing the agenda of disproportionately increasing the price of pizza every year. Is it any good, though? I wondered, worrying that the low prices would translate to a commensurate level of quality. The Margherita ($7.50) put those fears to rest on the first bite. 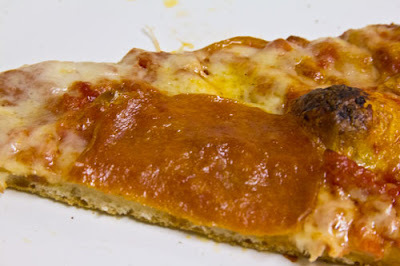 With the exception of the confusing addition of fresh grape tomatoes, which have no place on any pizza as far as I’m concerned, this was a sterling example of the classic bread/tomato/cheese/basil pizza that showcases a perfect harmony between few ingredients. 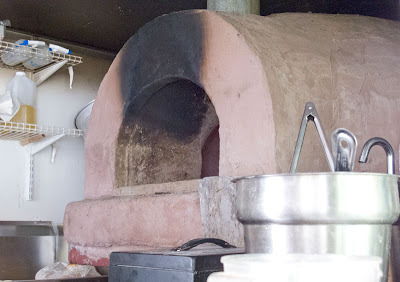 As I mentioned before, the dough is fermented for at least a full day and often longer, depending on the weather. Fully cooked, it contains a proper (read: generous) amount of salt and elicits decent char, although my Margherita was a little too blackened on one side. It happens. The tomato sauce feels thicker than the sauce on a VPN-certified pie, and it’s visibly augmented with a few dried herbs. The fresh mozzarella came properly melted (you have no idea how many times a wood-fired pizza comes with not-quite-melted mozz...or maybe you do) and was nicely salted to bring out the natural milky flavors. Again, the only misstep was the raw grape tomatoes, which, next to the sauce and cheese, didn’t offer enough flavor to warrant their inclusion. Now, if they were baked on the pie like the Filetti at Una Pizza Napoletana or pre-semi-dried and added afterward like this, it’d be a different story, but as is I just ended up picking them all off. Add to that the sweet, delicate onions Hutchinson grills on his flat top beforehand and you’ll be hard-pressed not to finish one of these pies singlehandedly in one sitting. It’s the ideal marriage of sweet and savory and you’d be certifiably insane not to order it (unless you’re, you know, vegetarian). What’s even more amazing about the fantastic pizza coming out of this cart is that Hutchinson’s menu isn’t even completely devoted to it; burgers and fries take up a full half of the offerings. As I haven’t yet ordered a burger from Kindle Kart I can’t comment on them, but I’m looking forward to trying one in the near future. 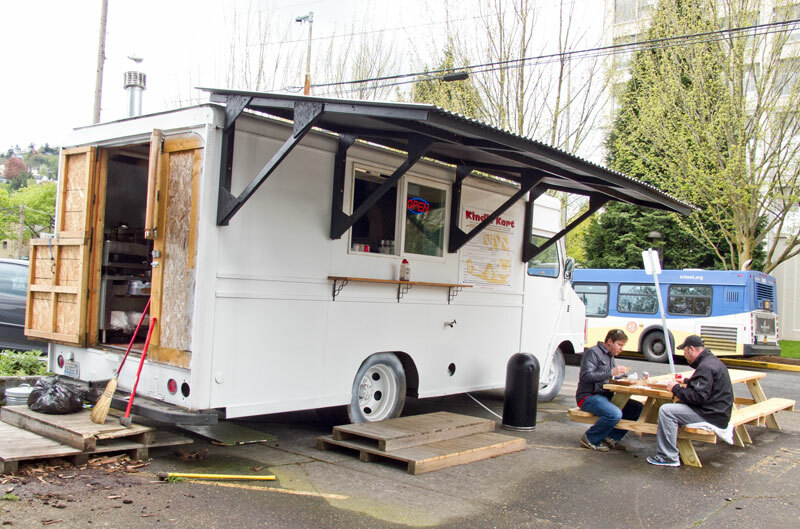 Kindle Kart raises the bar for cart pizza in Portland. The out-of-the-way location might seem like a trek, but I think it’s a trek worth taking. Don’t let this one fade like so many carts; it is absolutely worth your time and money. 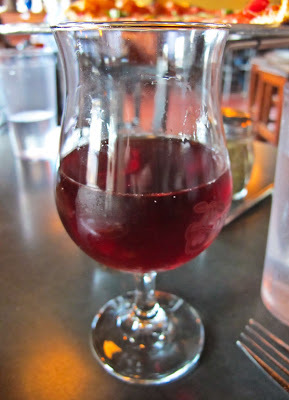 One of my biggest frustrations about living in Portland is that no brewery has food to match the quality of its beer. Even the breweries with more skilled chefs in the kitchen, like Hair of the Dog, are really hit-and-miss when it comes to the cuisine. On the non-brewery side, you're stuck with either a place with great food and not-all-that-interesting tap selection (Apizza Scholls, Ken's Artisan) or one with a great tap selection and awful food (Belmont Station, Horse Brass). [Editor's Note: To clarify, you'll always find great beers on tap at both Apizza Scholls and Ken's. I just mean that at either establishment, you're there for the food first and the beer second.] Another problem with the good food/limited taps restaurants is just that: they're restaurants, and you're not encouraged to be leisurely with your time there, which for many (including me) defeats the purpose of drinking beer in the first place. What the city really needs is a joint making delicious pizza that also brews several fabulous beers. A place like...Double Mountain Brewery. 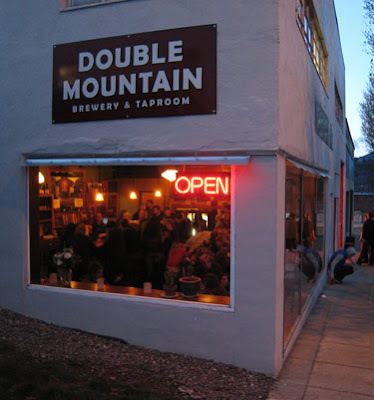 I first caught wind of Double Mountain when my friend Jim Bonomo reviewed it for Serious Eats. In his very positive review (from which I'll be stealing freely), he noted the pizza's heritage as thoroughly New Haven. For Portlanders who may not immediately know the style, the closest approximation is Apizza Scholls. If that hasn't lit your fuse, then perhaps you should stop reading right now. Double Mountain's pizzas are 16 inches in diameter, with the end crust lightly charred in places by the 700-degree oven. The bottom of the crust gets the nicest charring, with leopard spots aplenty. Like a good New Haven-style apizza, the bread hosts a nice chew beneath a crunchy exterior. 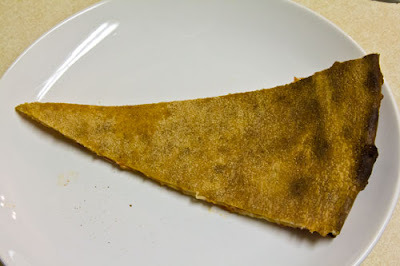 It feels even thinner than the crust at Apizza Scholls, so the front end tends to submit to gravity; just fold it in half lengthwise to avoid unsightly sagging. The Margherita ($17) is excellent. 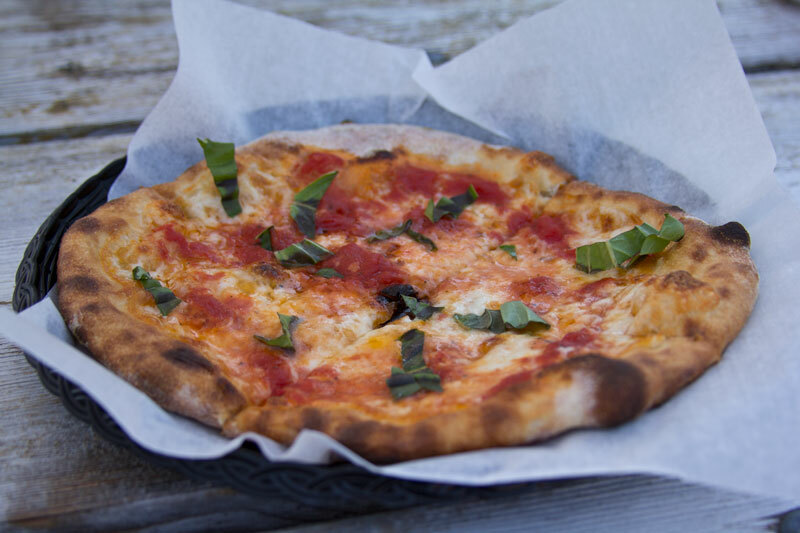 A bright and fresh-tasting tomato sauce (which you can smell from a block away as you approach the brewery) is applied liberally and topped with both aged and fresh mozzarella. Ample basil and garlic finish off the pie. 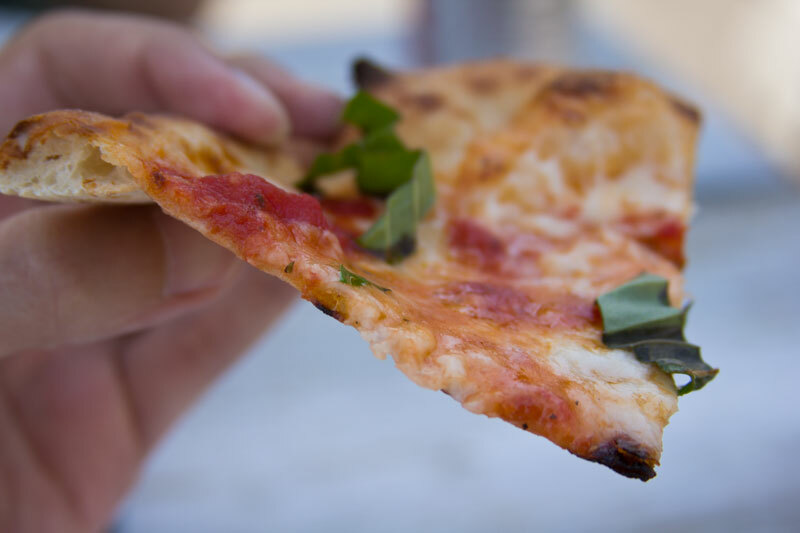 The flavor profile volleys primarily between the saltiness of the aged mozz and the vibrancy of the tomato sauce, with lots of garlic coming in on the palate at the end. This is a wonderful pizza, and it should not be passed up on any visit to the brewery. 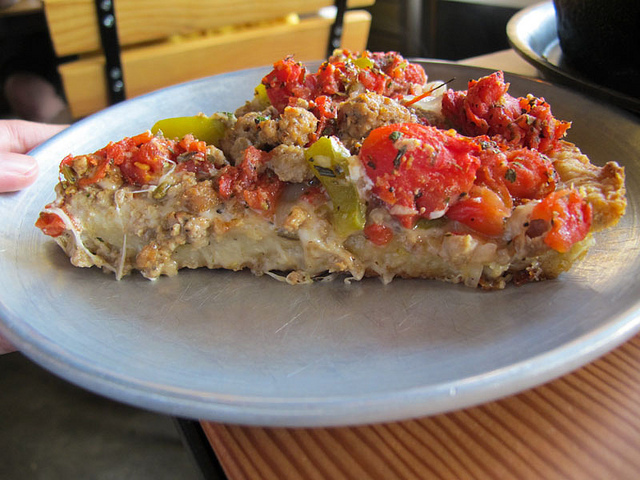 Among the five best pizzas in Oregon. I also sampled the Jersey Pie ($18), which may not be quite as successful as the Margherita but is still supremely satisfying. Here, the tomato sauce base gets a heavy crown of provolone, hot capicola (a cured pork salume), and the always-pleasant Mama Lil's pickled goathorn peppers. 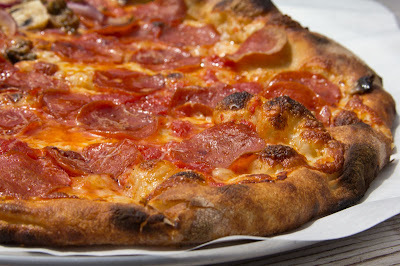 My only real complaint with this pizza is that the capicola is sliced too thick, so it doesn't really crisp up in the oven like it should (or rather, like I'd like it to). 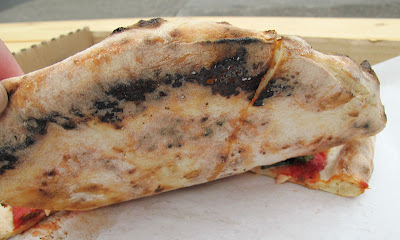 The provolone isn't noticeably different from the mozzarella on the Margherita, and it's clearly not the sharper piccante version of the cheese, but something much younger. Both the capicola and the Mama Lil's peppers provide a medium level of heat to the pizza, so spicy food haters need not fear breaking out in a sweat over this one. 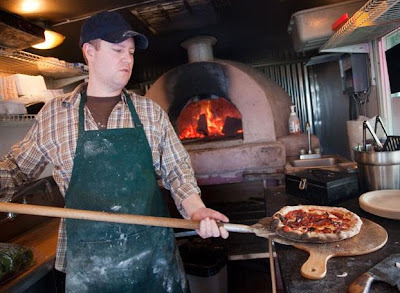 ADDED 4/22/12 -- It has come to my attention that one of the key reasons Double Mountain's pizzas are so great is because none other than Brian Spangler of Apizza Scholls serves as a sort of "unofficial consultant." In Brian's words: "I want to make sure that people understand that Charlie and the team at DM deserve a lot of credit for what they do. I didn't give them a formula and say "follow this." They care about the product and really took ownership of the program. They watched what we were doing at Apizza Scholls, asked questions, I gave pointers and they ran with it." I would be remiss not to mention the brewery's excellent lineup of beers, including its stunning Devil's and Rainier Krieks. These cherry sour beers have a higher alcohol content than your typical kriek, and both offer a wonderful balance between the sourness of the yeast and the fruitiness of the cherries (from the brewer's own orchard!) the beers meld with for several months. The current version of the Devil's Kriek on tap is the more sour of the two, with the tang coming from the Brettanomyces wild yeast applied to a brown ale base. A deep cherry red, it's a gorgeous ale, and a very drinkable one. The Rainier Kriek is even easier to drink, with a milder sour body and a golden ale base (fair warning, the ABV for this one sits at around 10%). I sincerely hope Double Mountain continues to brew both of these for the foreseeable future, as I think sour ales are the most exciting beers out there right now. They're certainly among my favorites. So it was with a frown on my face and a tear in my eye (all right, perhaps I'm exaggerating) that I bid Double Mountain Brewery farewell. Portland has nothing on this scale of great food and great beers in one location (I don't know anywhere else you can order this level of pizza and a sour ale), so we clearly need a Double Mountain outpost as soon as is humanly possible. Naturally, one of the (extremely) unfortunate side effects of moving a place like Double Mountain to Portland is that you would never ever be able to get a table. It's like trying to go out for brunch in this town; you absolutely cannot do it without an agonizing wait no matter where you go. Even in Hood River, with its miniscule population of 7,000 or so, every seat in Double Mountain's taproom was filled at 4:45 on a Thursday afternoon except for one table, which my fiancé and I were lucky enough to snag. That isn't to say I'm not encouraging Double Mountain to set up shop here. I just want them to make sure that, if such a miracle were to occur, that they purchase a gigantic warehouse for the inevitable throngs of people like me who will come knocking on their door night after night after night.